I’ve been talking at length on my love for all things Valiant, going over the history of the company as well as my history in reading their comics. As promised, I will now start detailing over the next several posts the amazing characters and stories that make up this comic universe! What’s it all about: Aric of Dacia, a 5th Century A.D. Visigoth (and nephew of Alaric, he who eventually sacks Rome, check yer history) is abducted by an alien race called the Vine. Forced into servitude for years on one of their starships, he later rallies other slaves into open rebellion against their masters, and is able to steal the Vine’s most holy religious artifact. This artifact also happens to be the most powerful weapon in the galaxy – the sentient X-O Manowar armor. Donning the armor and making his escape, Aric returns to Earth to find 1,600 years have passed. All he knows is gone, and now the most primitive man on Earth wields the most powerful weapon mankind has ever seen. Why I love it: Author Robert Venditti has crafted an epic sci-fi tale in X-O Manowar. Initially focused on Aric and his return to a world he doesn’t belong, things quickly shift to the world at large dealing with this man wielding more power than he probably should. 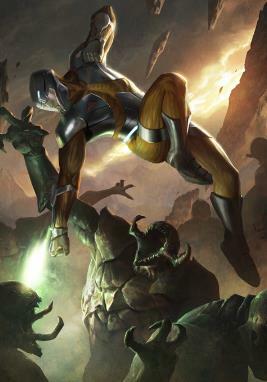 The picture than broadens to action and adventure on a cosmic scale, as X-O Manowar introduces the world (and the reader) to the extra-terrestrial aspects of the Valiant Universe, changing the world in the process while keeping things grounded in the story of a man dealing with having his entire life ripped away from him. What’s it all about? Similar to mutants made famous by the X-Men franchise, the Valiant Universe has ‘psiots’ – individuals gifted with amazing abilities and powers. Chief among them is Toyo Harada, a celebrated industrialist and philanthropist whose powers were “activated” during the atomic blast at Hiroshima. The strongest of all psiots, Harada is determined to use his abilities to the benefit of all mankind, and operates a shadow organization known as The Harbinger Foundation that specializes in locating, activating, and training other psiots to join in his vision. Enter: Peter Stanchek. A teen-ager and psiot gifted with incredible power equal in strength to Harada. Unlike your typical psiot, Peter was born with his powers already activated, and has spent most of his life in and out of mental institutions. On the run from the authorities, Peter self-medicates as his only means of keeping his powers under control. Harada reaches out to Peter and brings him into the Harbinger Foundation, but it is there where the lines that define right and wrong, good and bad, begin to blur. It’s in this ambiguity that a secret war is waged, and in a unique “status quo shaking” twist, Valiant actually ended the Harbinger series with issue #25. I want to be clear that it was not cancelled, but rather the story took such a dramatic turn of events that it didn’t make sense to be called Harbinger anymore. Rather, a second book/chapter/part two/call it what you want began last month in a new series – Imperium, which continues the overall Harbinger story. What’s it all about? 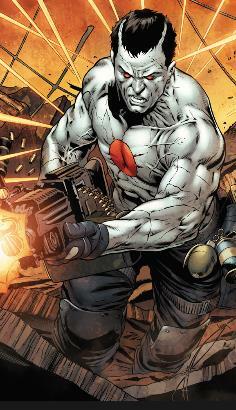 Bloodshot is the story of a man reconstructed into the ultimate soldier… a hybrid of man and machine; his blood replaced with microscopic machines that grant him increased strength and speed, a healing factor capable of handling the worst of injuries or altering his appearance, and the ability to network with and control other machines. We join our hero seemingly on a rescue mission for the military into Afghanistan… except for the small fact that everything he was told about this mission is a lie. Not only that, but everything he believes about himself… also a lie. And after a glimpse of the truth is revealed to Bloodshot, well, let’s just say his real employers are none too anxious to have him out of their control, and resolve to bring him back in pieces if need be. The ultimate soldier has now become the ultimate quarry. Why I Love It: Take one part Rambo, one part Bourne Identity, and one part Terminator. Mix it all together, and you have Bloodshot. This Frankenstein type tale mixes up a lot of tried and true stories – the walking engine of destruction with no recollection of his past, rebelling against his creators to find his true history… all the while getting into a whole heap of trouble. On top of all that, Bloodshot is very active through-out the whole Valiant Universe. Many examples of how the characters and stories interact find Bloodshot right in the middle of it all. Like Harbinger, Valiant ended the Bloodshot series at issue #25. This was not the end of Bloodshot’s tale, though, as he currently is co-starring in The Valiant mini-series. More on that for another time, but the key take away for now is that a new series, Bloodshot: Reborn, will spill out of the conclusion of The Valiant, and based on early interviews with writer Jeff Lemire, this promises to be a story that places Bloodshot as the focal point of the Valiant Universe! That’s all for now gang, but check back here in a couple of weeks as I continue to highlight the characters and stories of the Valiant Universe!